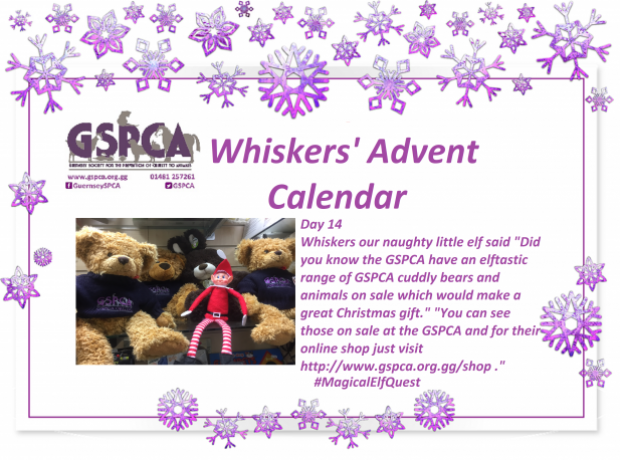 It’s the 14th December and today Whiskers our naughty little elf said "Did you know the GSPCA have an elftastic range of GSPCA cuddly bears and animals on sale which would make a great Christmas gift." 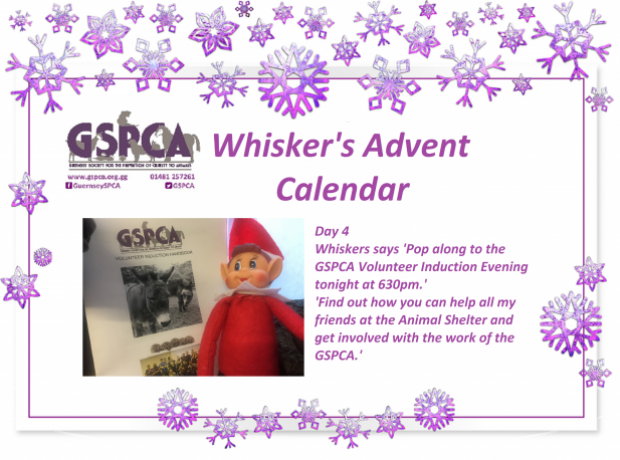 "You can see those on sale at the GSPCA and for their online shop just visit http://www.gspca.org.gg/shop ." 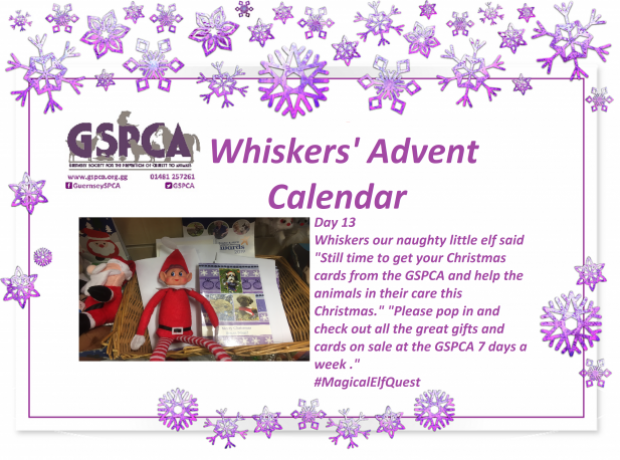 It’s the 13th December and today and Whiskers our naughty little elf said "Still time to get your Christmas cards from the GSPCA and help the animals in their care this Christmas." 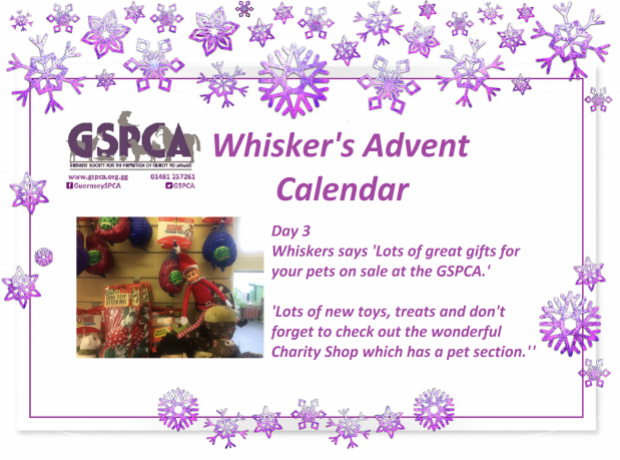 "Please pop in and check out all the great gifts and cards on sale at the GSPCA 7 days a week ." 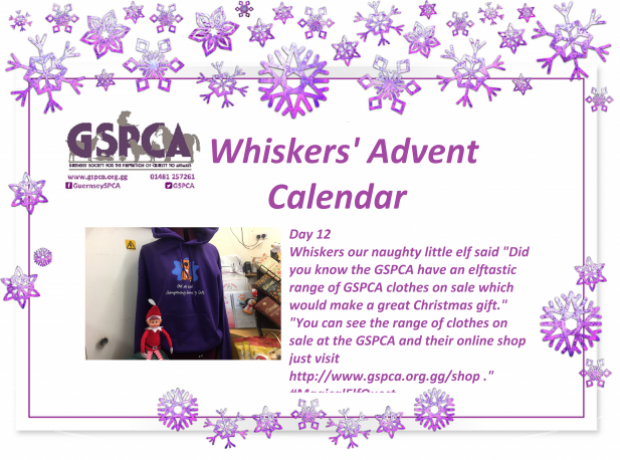 It’s the 12th December and today and Whiskers our naughty little elf said "Did you know the GSPCA have a elftastic range of GSPCA clothes on sale which would make a great Christmas gift." "You can see the range of clothes on sale at the GSPCA and their online shop just visit http://www.gspca.org.gg/shop ." 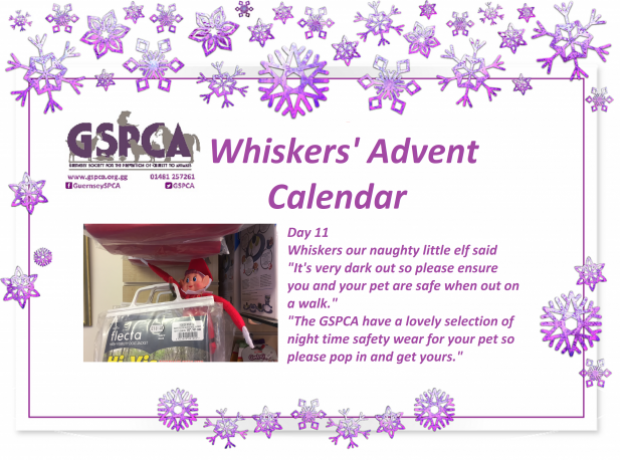 It’s the 11th December and today Whiskers our naughty little elf said "It's very dark out so please ensure you and your pet are safe when out on a walk." "The GSPCA have a lovely selection of night time safety wear for your pet so please pop in and get yours." 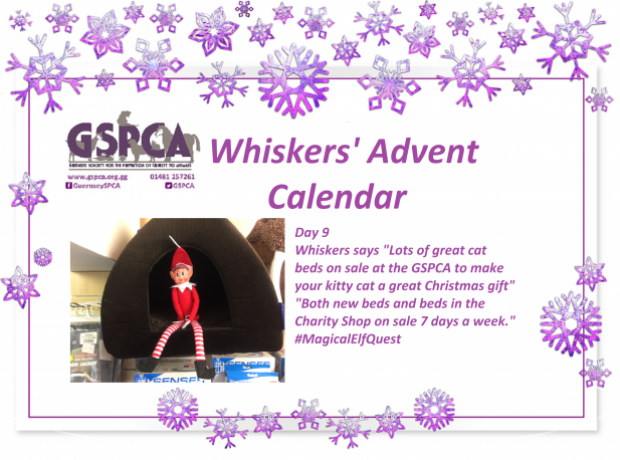 It’s the 9th of December and today Whiskers our naughty little elf said "Lots of great cat beds on sale at the GSPCA to make your kitty cat a great Christmas gift"
"Both new beds and beds in the Charity Shop on sale 7 days a week." 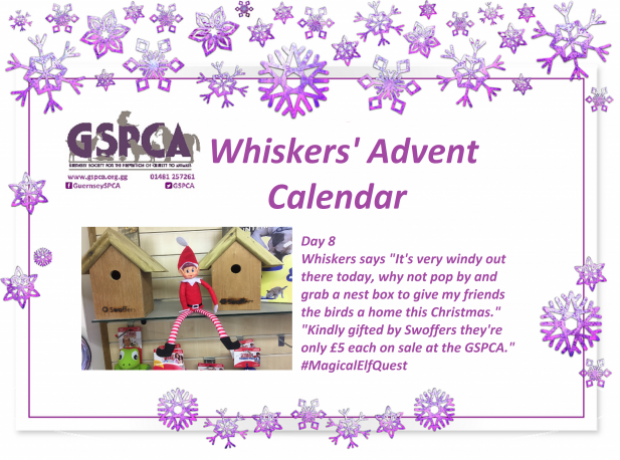 It’s the 8th of December and today Whiskers our naughty little elf said "It's very windy out there today, why not pop by and grab a nest box to give my friends the birds a home this Christmas." "Kindly gifted by Swoffers they're only £5 each on sale at the GSPCA." 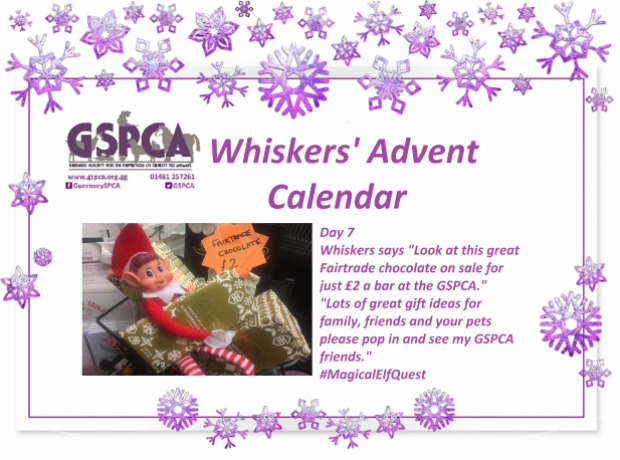 It’s the 7th of December and today Whiskers our naughty little elf said "Look at this great Fairtrade chocolate on sale for just £2 a bar at the GSPCA." 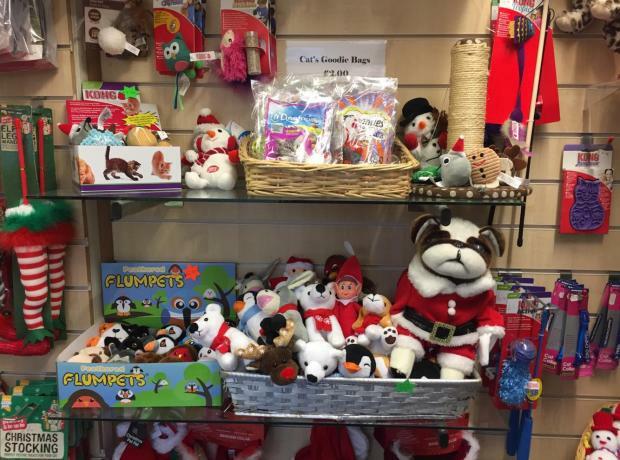 "Lots of great gift ideas for family, friends and your pets please pop in and see my GSPCA friends." We have now set our inductions for 2019 and the last of 2018 is tonight Tuesday 4thDecember at 630pm. This year alone we have now inducted 170 new volunteers, placements and work through these inductions and are graced with an average 120 volunteers helping each week, but with over 500 animals in our care there is always plenty to do.